On 4 September 2014, Ambassador Madeira, AU Counter-Terrorism Cooperation Special Representative and Director of the African Centre for the Study and Research on Terrorism and ACSRT staff members, received a delegation of the Japan International Co-operation Agency led by Mr. Hatouri Osamu, Deputy Director of the Office of Security Management, General Affairs Department. H.E Ambassador Madeira lauded the Japanese delegation’s willingness to study the possibility of cooperation with AU Member States in the area of counter-terrorism. 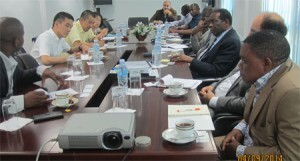 He briefed the delegation on the role, mandate and objectives of the ACSRT. He also provided the delegation with an overview of the AU CT strategy and highlighted the unprecedented challenges faced by the continent, and ways to deal with them, especially the threats of terrorism and violent extremism. The discussions also touched on potential areas for further cooperation between the ACSRT and JICA.